Understandably, when you’re starting lessons getting a piano is a big expense, especially if you’re not sure you’re going to continue yet. Finding the best affordable beginners piano is not easy, but there is one that students have had luck with over the years. 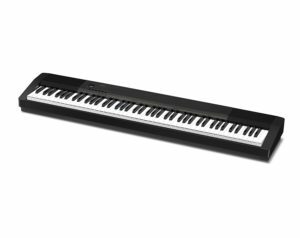 In terms of price, the cheapest weighted keys digital piano that I know of that’s remotelygood is Gear for Music’s SDP2 Stage Piano (link here). Whilst it’s really on the cheaper end. It will definitely see you through your first year, and if you’re not too sniffy ;)… potentially more! It’s really essential to have weighted keys as these emulate the action of a real piano. You must be careful when buying a piano/keyboard that it’s not a simple ‘keyboard’ – but one with ‘weighted keys’ or ‘hammer action’. Of course, you can call me if you have any questions or want me to look at it for you. 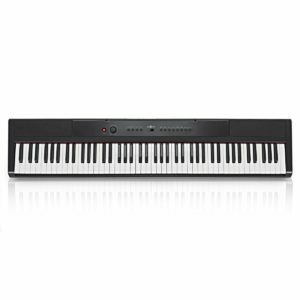 If your budget is slightly higher, there is also this Casio CDP-130BKC5 Piano for £297 (link). I would also suggest going down to Mickleburgh Ltd or PMT at some point. It’s really good to get their advice and play on pianos yourself. Sorry to not give an easy ‘buy this!’ recommendation. With the £199 one above, you’re potentially likely to start noticing some drawbacks in a few years.. although they will be minor.